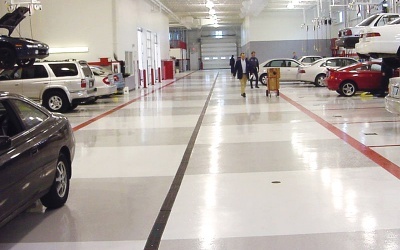 The floors throughout an automotive facility have to be incredibly versatile due to the specific needs of each individual area. 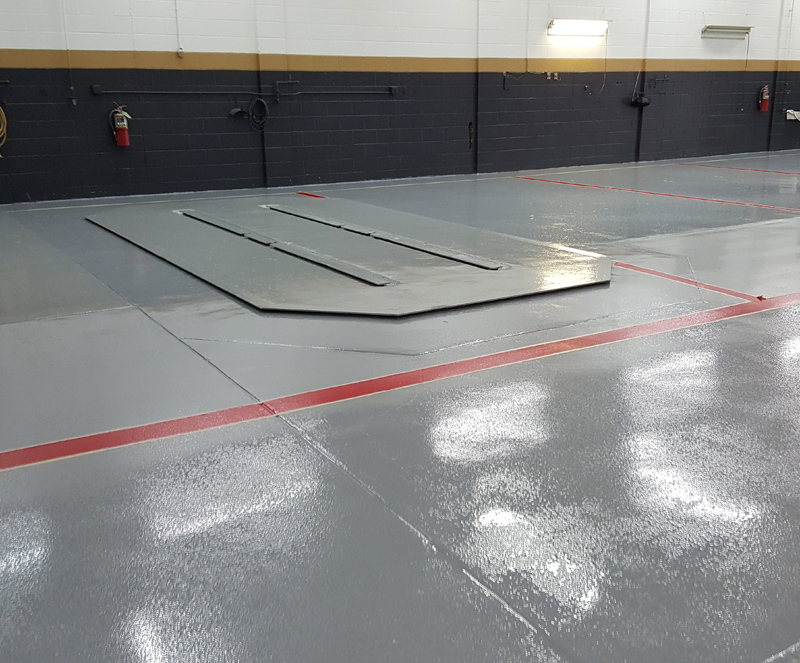 Whether you need a beautiful high-gloss coating for your showroom or an extremely durable and chemical resistant coating for your service bays, UCoat It has the perfect system for you. 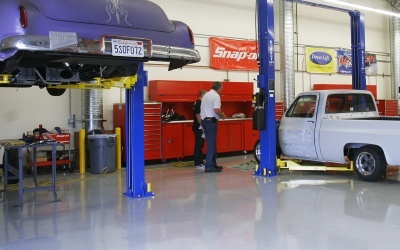 It is because of our wide variety of systems and industry proven products that customers like BMW, Jay Leno’s Big Dog Garage, ACDelco and Universal Technical Institute have chosen UCoat It. 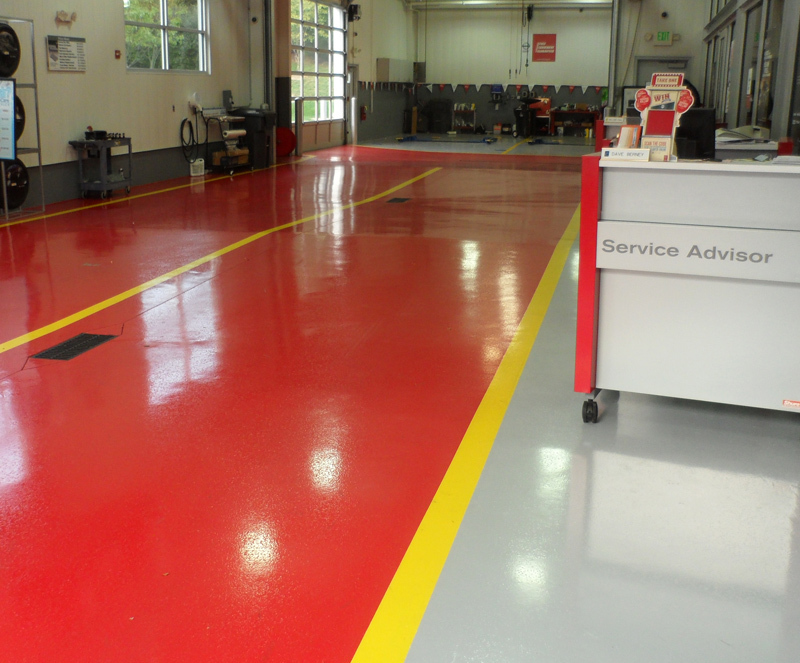 Between your oil changes, warranty repairs, fluid exchanges, electrical work, and occasional body work, the floors throughout your service bays take quite the beating. 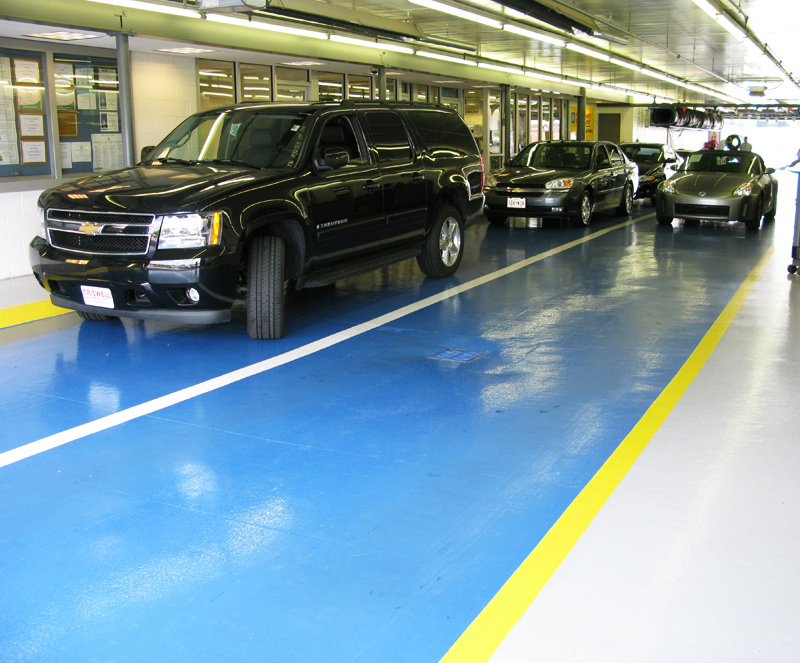 To prevent your substrate from wearing down prematurely or becoming entirely oil soaked you need an automotive grade floor coating. 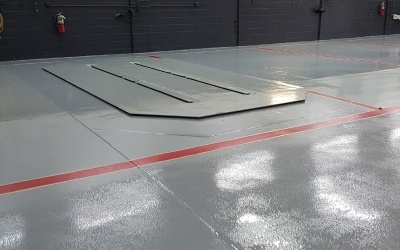 With our industry proven automotive epoxy floor coatings you can trust that our products will not only provide exceptional durability but also a highly chemical resistant finish. 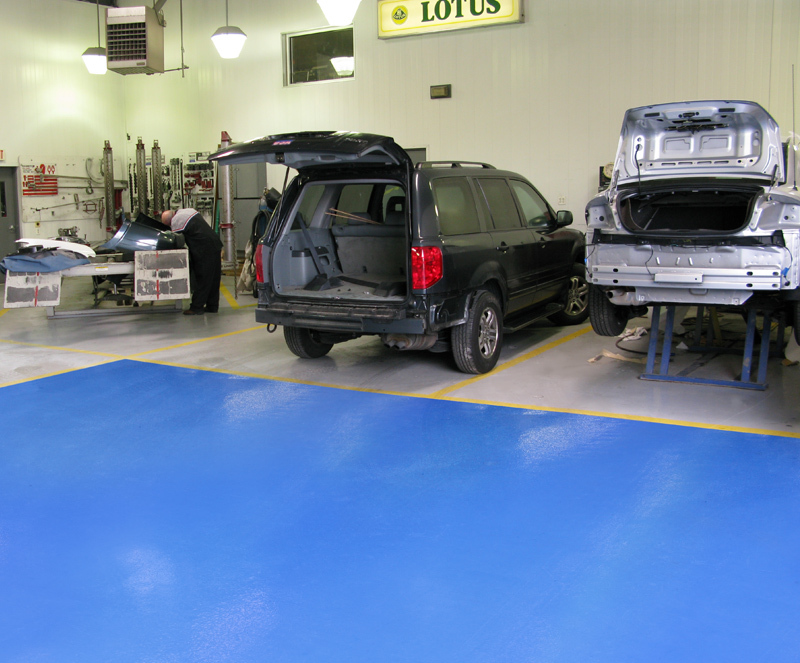 Optional solvent based top coats are designed specially for automotive use and are resistant to oil, gas, brake fluid, and much more. 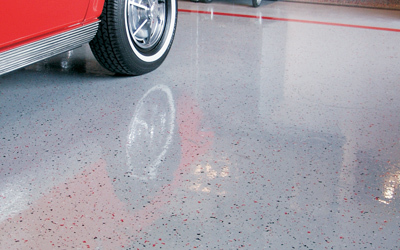 Commercial-grade finish helps resist scratches and scuff marks caused by heavy machinery. 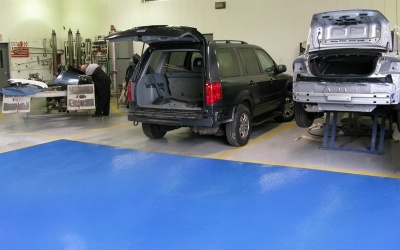 Specifically designed to withstand most automotive fluids like oil and gas. 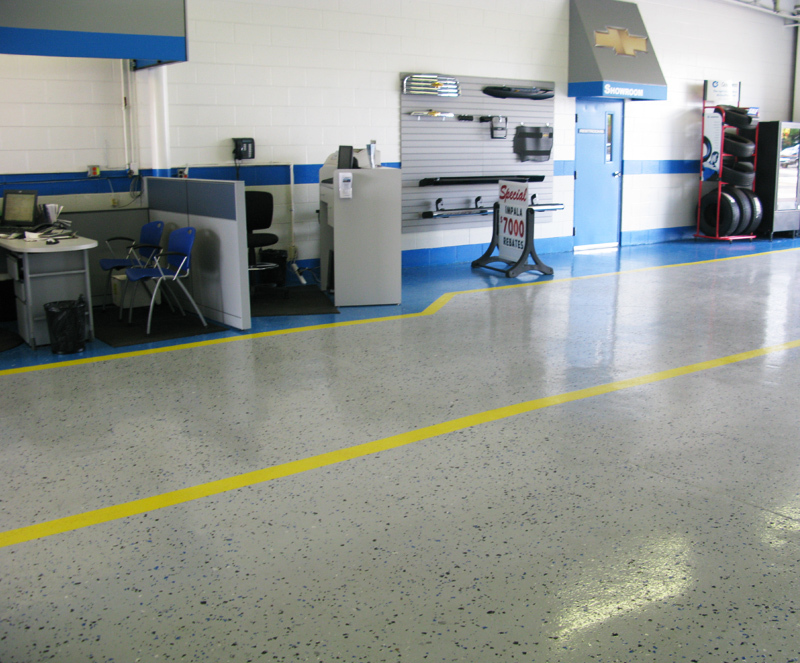 Superior Abrasion Resistance Commercial-grade finish helps resist scratches and scuff marks caused by heavy machinery. 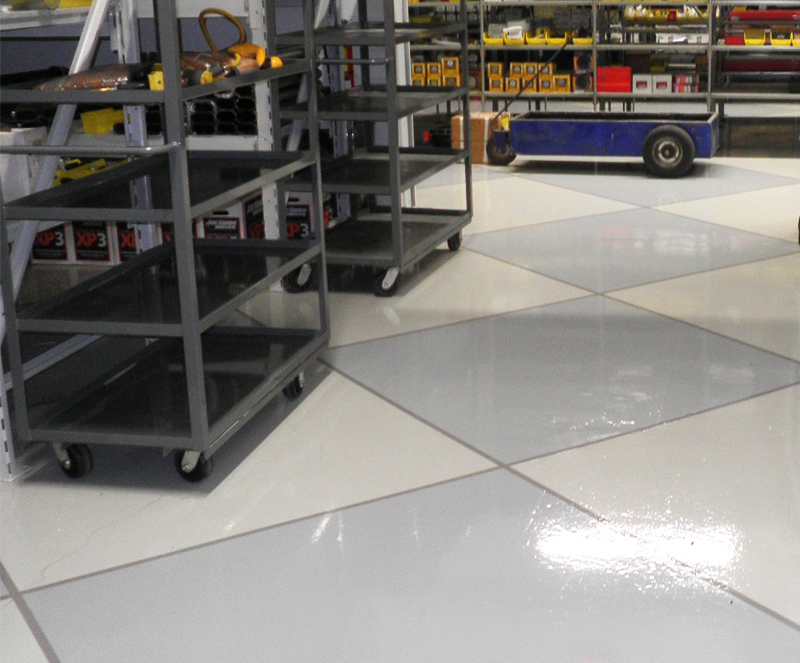 Just imagine, in just a weekends time you can transform your space into a truly stunning showroom with one of our high-gloss, epoxy floor coatings. 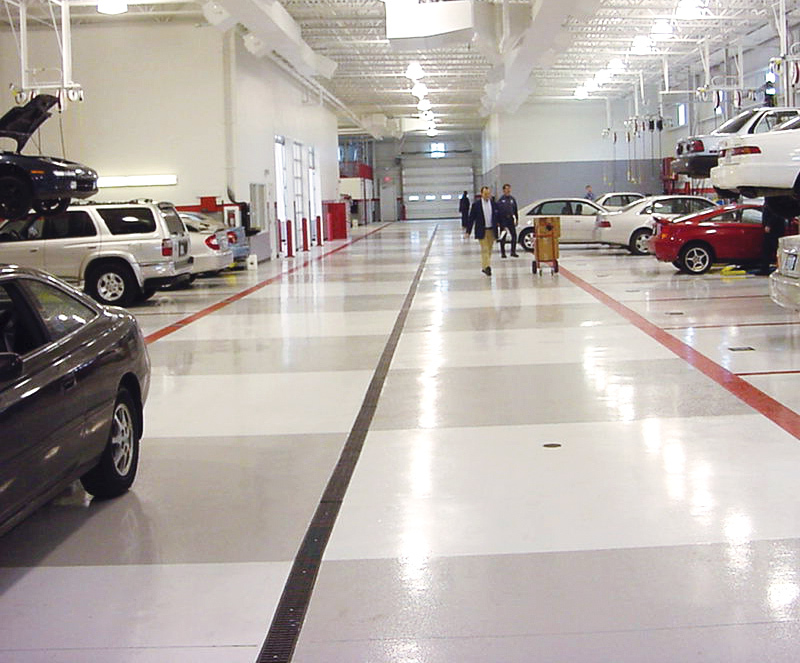 No matter what your tastes, from exotic finishes like a metallic epoxy, to a more traditional solid bright white, we’ve got what it takes to make your showroom really pop! 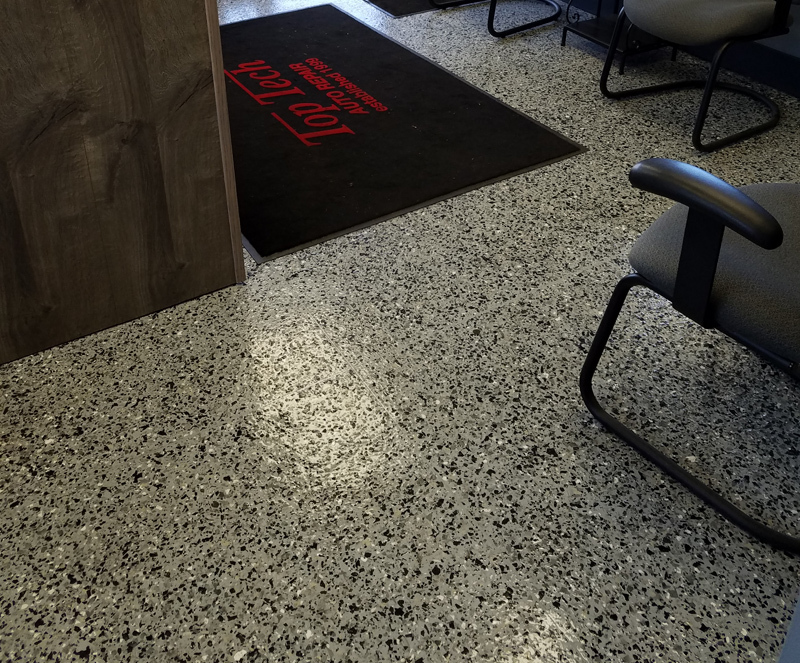 Unlike tile that is commonly used in automotive showrooms, our products provide a seamless design allowing for easier clean-up. 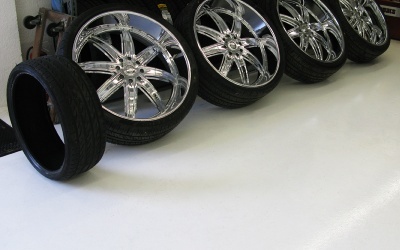 Warrantied against peeling, blistering, and hot tire pickup, you can apply our floors with confidence knowing that they have been used with great success across the automotive industry for decades! 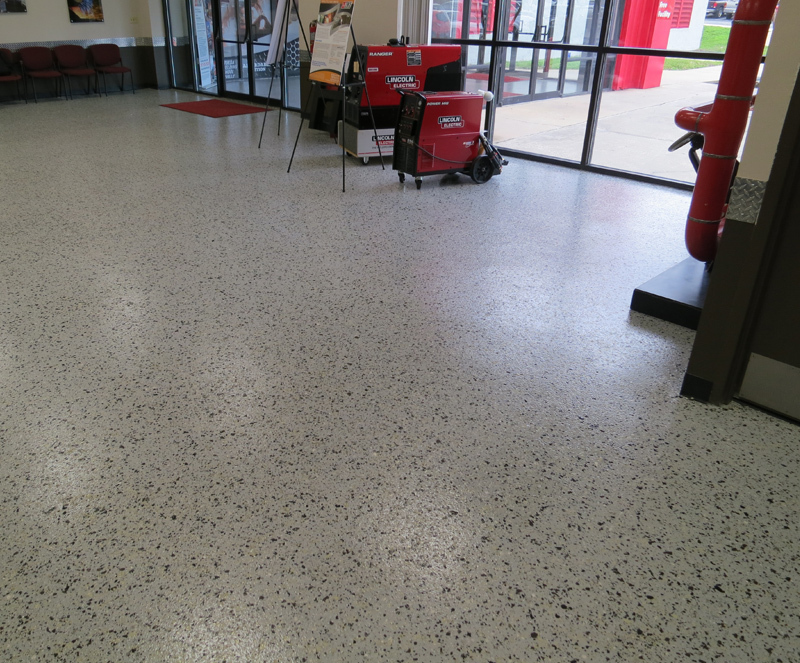 High-gloss finish increases light reflectivity making for a brighter and more pleasant environment. 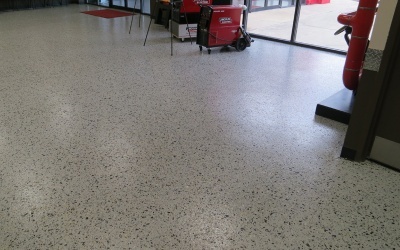 Thirteen standard colors and over sixty decorative aggregate colors. 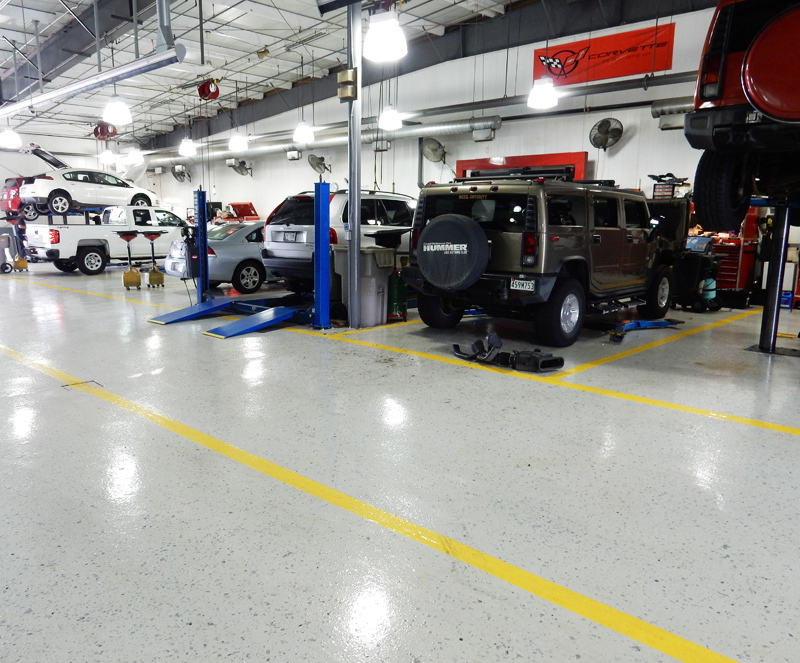 Exposed concrete floors in an automotive setting like a body shop will quickly become oil soaked and overtime, the heavy vehicle traffic, metal shavings, welding slag, and corrosive chemicals will take its toll. 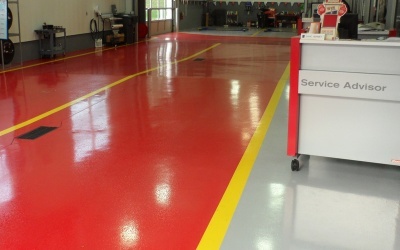 Premature wear like surface cracks, chipped or spalled areas can be prevented though with one of our protective floor coatings. 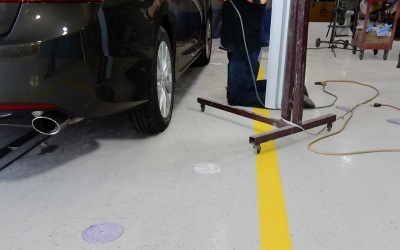 Built specially for automotive use, our products are designed to withstand these harsh environments including exposure to automotive fluids like oil, gas, brake fluid, and more. 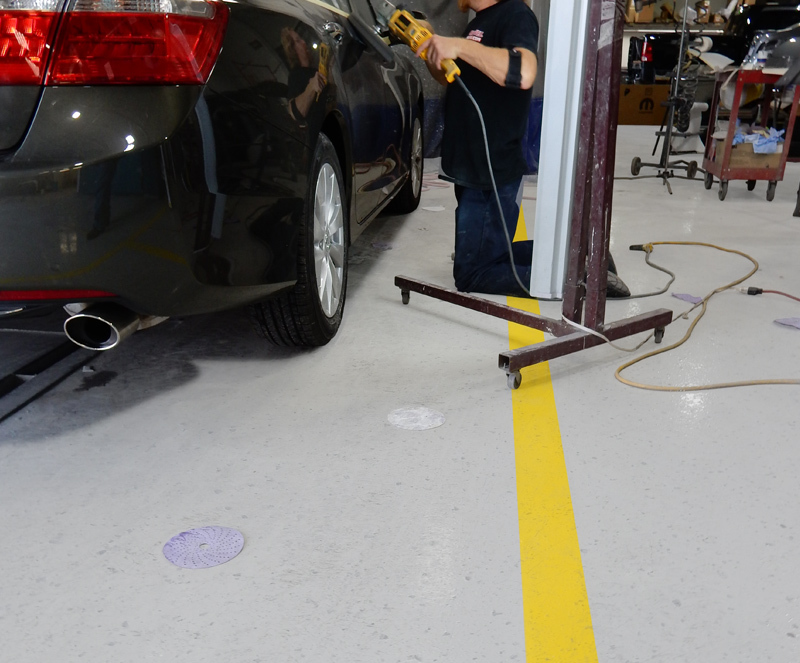 See our recommeded systems below. 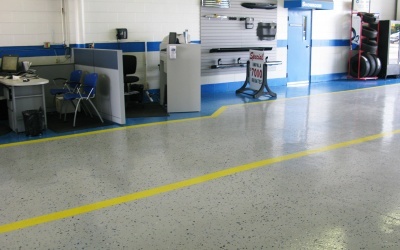 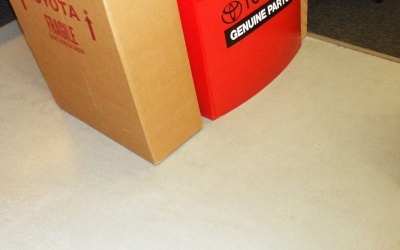 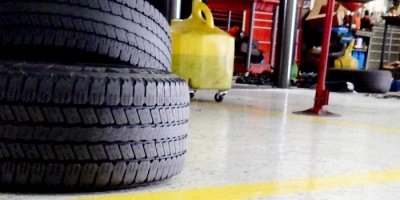 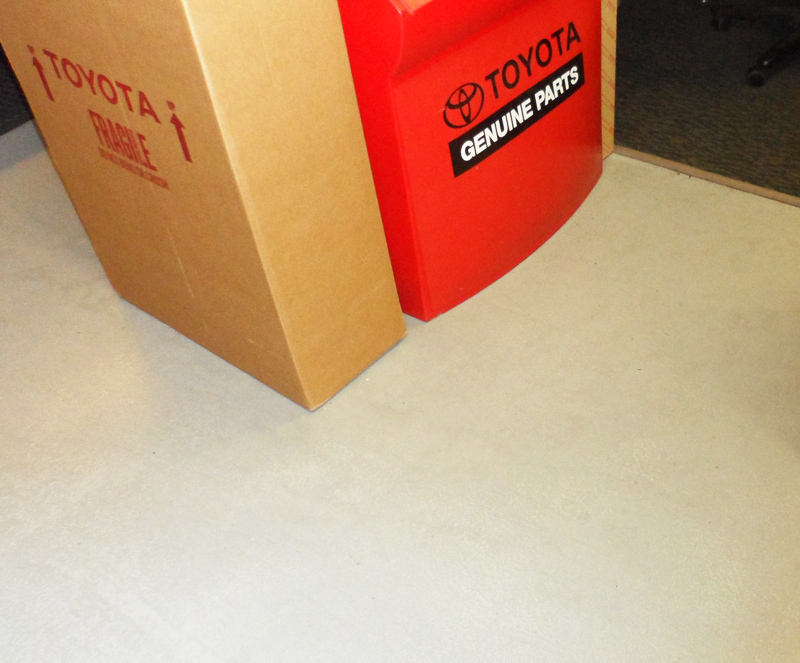 Extremely rugged floor coatings that have been used in thousands of automotive shops nationwide. 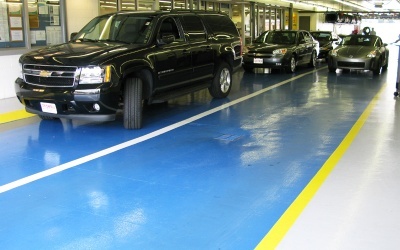 Choose from 2 different anti-slip aggregates designed to provide you with non-slip finish. 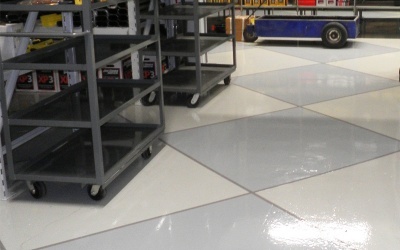 Customer facing areas of your shop or dealership require a unique solution for your floors. 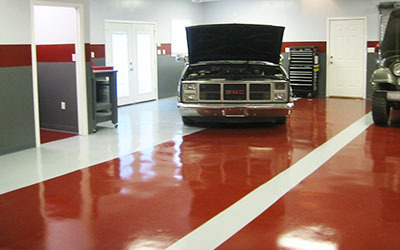 Ideally you would have a floor that not only will hold up to all that vehicle traffic, but one that looks good doing it too. 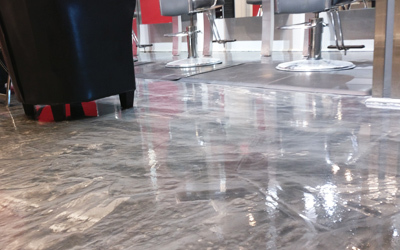 No matter what type of design you are trying to achieve we have everything you need to complete your project. 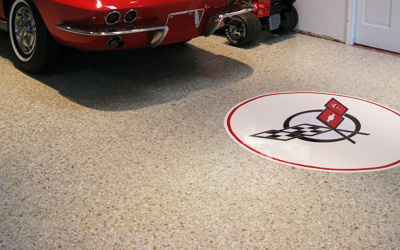 We offer classic solid color systems, flake-based systems, optional pinstriping, metallic finishes, etc. 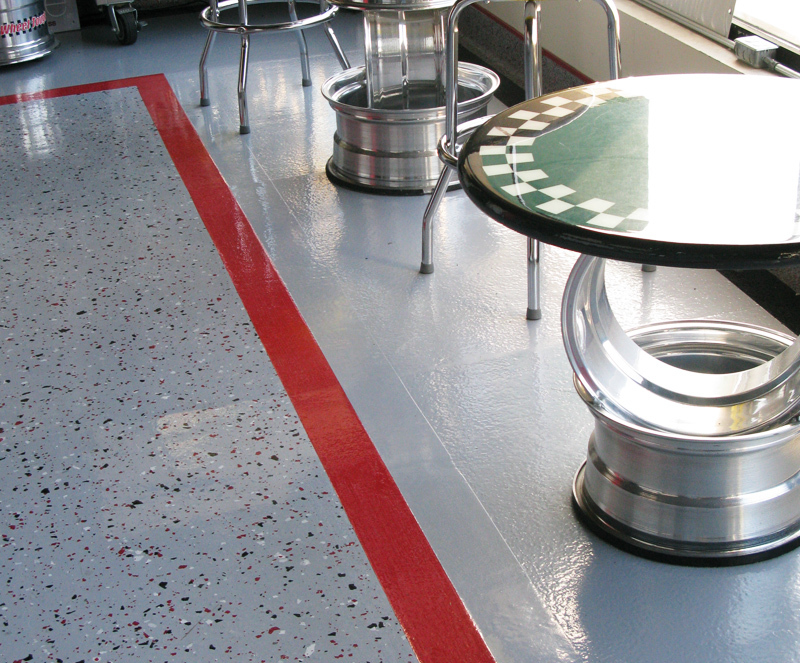 All these decorative options can be paired with our automotive, urethane-based top coats giving you added chemical and abrasion resistance! 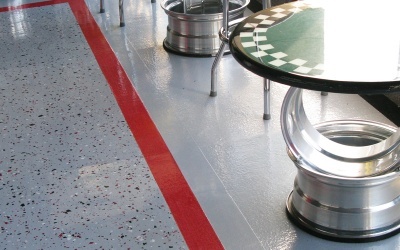 High-gloss coatings can be fully customized and safety colors can be used to designate walkways. 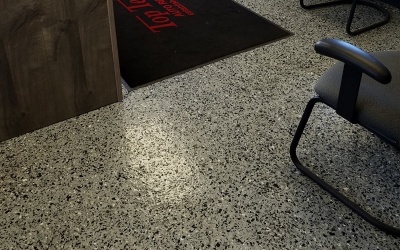 Warranted against peeling, lifting and blistering insuring your floor coating will last for years to come. 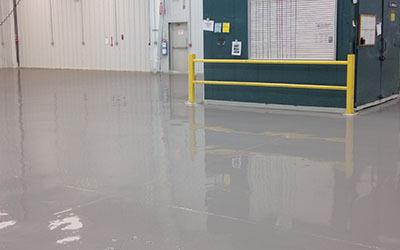 Your parts department is typically not an area that is seen by your customers and doesn’t have the same amount of traffic as your service bays, but that doesn’t mean it can’t benefit from a floor coating. 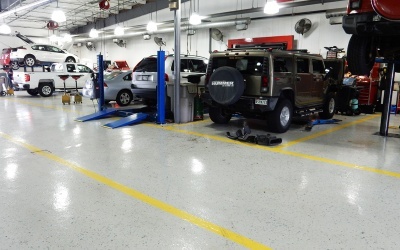 It’s a safe bet to assume that most parts departments are small, dark, and dirty spaces that are rarely maintained to the level of the rest of your facility. 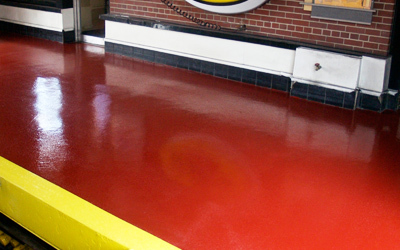 It doesn’t have to be that way though, with our epoxy floor coatings you can apply a simple water-based product that will hep to brighten up the space and make cleaning easier, all for a lot less than you might think! 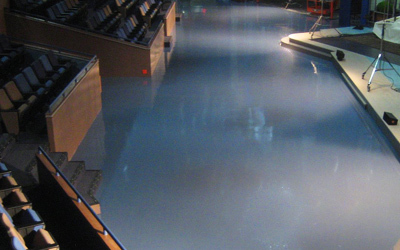 Optional water based systems are a great option for areas with poor ventilation. 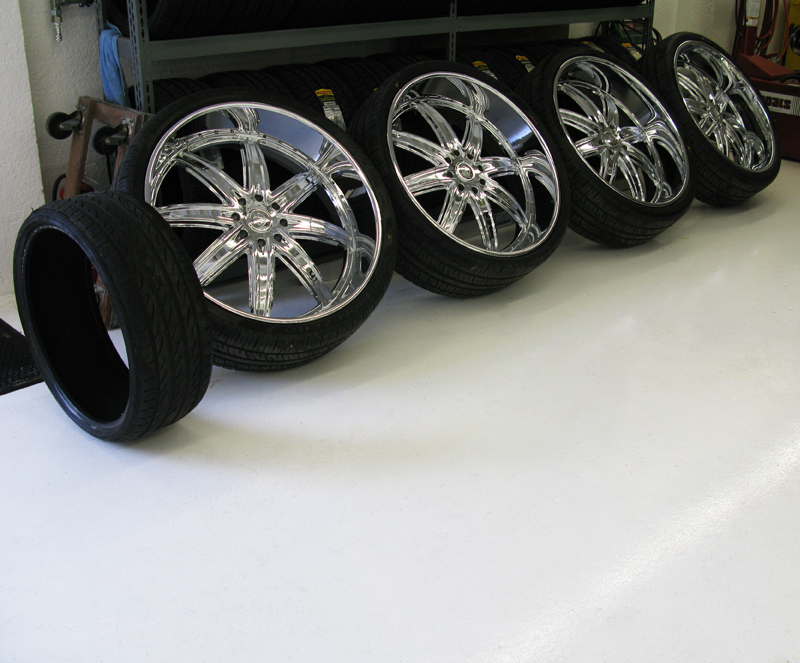 High-gloss systems increase efficiency of lighting systems 35-45%.